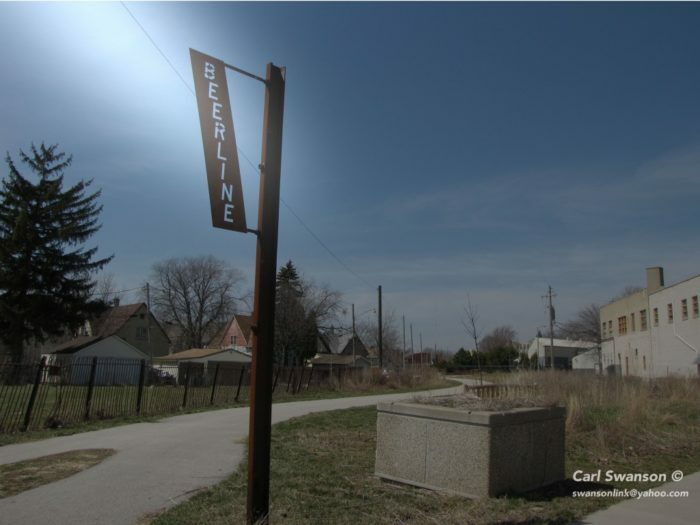 Once used by freight trains to transport beer ingredients to some of Milwaukee’s famous breweries, the Beerline Trail is a recently renovated addition that runs north to south along the western side of the Milwaukee River. It’s a good connector between the Upper East Side and Lower East Side neighborhoods. This trail has two disconnected segments (listed below). The trail begins at Pleasant Street, just north of Downtown Milwaukee and goes north through Gordon Park and continues through the Riverwest neighborhood following the path of an old railroad line. At Riverboat Road, the trail switches from wide sidewalk to an off-road path. A switchback trail midway along this stretch leads up to Kadish Park, a great spot to take in views of the river and urban skyline. Another highlight is Marsupial Pedestrian Bridge, which hangs under the Holton Street bridge and takes you across the Milwaukee River, overlooking Lakefront Brewery. The mapped route starts at Gordon Park and heads south towards E Pleasant St, where you’ll cross the river and head onto Brady St. To connect back onto the trail, take the Marsupial Bridge to cross back over the river and onto Oak Leaf Trail which eventually meets back up with Beerline. Gordon Park, 2828 N Humboldt Blvd.